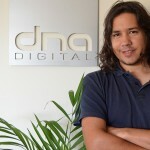 My name is Dylan O’Donnell and I started DNA Digital in my bedroom in 2001. It has since grown into a multiple staffed, public office company. I currently live and work in Byron Bay, NSW. When I’m not doing website development, graphic design and online marketing I might be playing guitar, outside practicing astrophotography or doing something geeky with my son, like playing with spaceships or lasers. As the founder and director of DNA Digital, I welcome your feedback and solicitation for project assistance or partnership. We are building a great team and looking for great projects to work on.